The State Prosecutor's Office submitted its response on Sunday to the High Court, in which it stated that during the last two weeks it has been decided to further investigate the death of a Palestinian girl three years ago. Bassam, father of the 10-year-old Abir Aramin, filed a claim against the attorney general and two border guards, requesting that the two stand trial. About a month ago, the Supreme Court issued an order nisi instructing the state to explain within 30 days why the attorney general had not ordered an investigation. Since then, Bassam and his attorney, Michael Sfarad, have awaited the state's reply. In its response, the State Prosecutor's Office provided details about a report from a private investigation bureau. The document was prepared in February 2009, as part of the Defense Ministry's efforts to formulate a stand vis-à-vis the claim submitted by the claimants. The report contained extracts of conversations with a number of residents of Kufr Anata, where Abir had lived, which had not been submitted to the police in the initial investigation. As a result, a meeting was convened with Deputy Attorney General Yehoshua Lamberger, in which it the possibility arose of reopening the case. About a week later another meeting was convened at the State Prosecutor's Office, in which representatives of the Judea and Samaria police were present. It was decided that further investigation into the death of Abir Aramin was warranted, in order to get residents' testimonies as they appeared in the report, among other things. The State Prosecutor's Office noted that at the end of the investigation, evidence would be reexamined and a decision would be taken by those authorized. The Office also noted that the claim should be erased because the aims of the claim had been achieved. A short time after the incident in which the girl was killed, her family published a pathological report with assistance from the human rights organization B'Tselem. According to the report, Abir was killed by a rubber-coated bullet which hit her head. However, the police denied this, and said the post mortem clearly showed that the girl had not died as a result of the shooting. The case will be reopened. 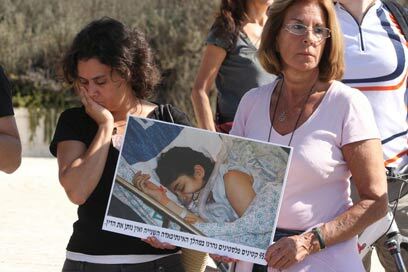 See all talkbacks "Case of Palestinian girl's death reopened"